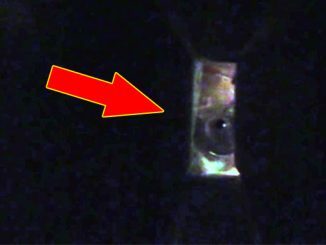 The following scary videos are so bizarre they almost shouldn’t exist. From a shadow figure filmed on a plane to a real-life Men in Black agent caught on security camera, these scary videos are sure to creep you out. In late 2018, security guard Francisco Hernandez from Mexico City heard strange thumping noises coming from a disused plane at the airport. He boarded the craft to investigate – what he discovered is chilling. As Hernandez shines his torch down the aisle of the plane he hears some noises from the rear of the craft. He takes a look but can’t find anything to explain the strange noises. Then as he’s walking back down the aisle he hears the noise once more and turns around. At the end of the plane you can see a shadow figure peer around the corner. It tentatively looks and hides. As the security guard gets closer it’s obvious that some kind of shadowy entity is looking right at him. In a panic, he turns and runs. When the video was posted to social media, it naturally garnered a lot of attention. It even got picked up by a number large news outlets. Since then, viewers have been debating what the shadow figure could be. The majority of comments believed it to be a ghost, perhaps someone who died at the airport. Others thought it was a demonic entity making itself known to the patrolman. Skeptics thought it must be hoax and that the shadow effect has just been added in afterwards. However, it should be noted that running a hoax like this would jeopardise Hernandez’s employment considering he has access to airplanes after hours. One would assume his security clearance is quite high. Would Hernandez make a prank video and put his career on the line? Or did he genuinely capture something paranormal on camera? This video was shot in 2005 in an unknown graveyard. 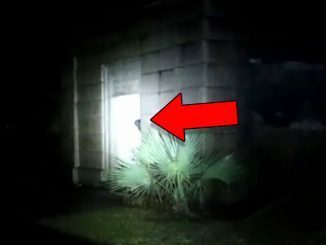 The uploader said they were filming in a cemetery and didn’t notice anything strange at the time. It wasn’t until several days later, when they reviewed the footage, that they noticed a bizarre alien-like figure. In the clip you can see the camera holder walking among tombstones. They pan randomly across the yard, not focussing on anything in particular. However, when you slow the video down, you can see something truly startling. Right in the centre of shot, there’s a figure hiding behind one of the graves. It looks to be humanoid in shape. You can make out a head, body and arms but it looks almost camouflaged – blending in with the scenery behind. 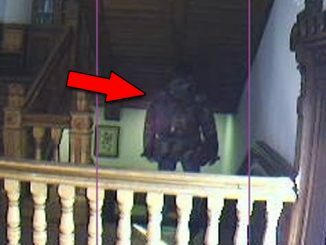 Comments on the video vary with some calling it a ghost or demon. But the majority agree that it looks like a common depiction of an alien. The bulbous head and large black eyes seem to be the defining features that make people believe this creature is something from another world. Of course, there’s always the possibility that this is simply CGI. Unfortunately, without further information, this scary video will remain a mystery. 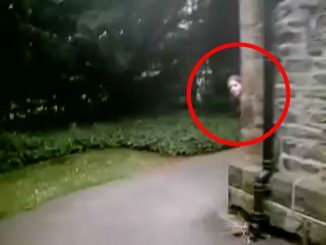 Sticking with the cemetery theme, this bizarre piece of footage began circulating social media sites in mid-2017. It appears to show some kind of strange creature digging in a cemetery. Two girls from Akron, Ohio were on their work break when they decided to kill some time by driving through the local cemetery. In the footage you can see some kind of strange animal digging up the ground. It’s clawing at the dirt with its right hand, over and over. It looks to be on its hands and knees much the same way a human would dig with their hands. However, whatever it is, it seems to be covered in a dark fur. Unfortunately, the quality of the footage is low, so it’s hard to tell if the creature is burying something or digging something up. Given that it’s a cemetery, you’d lean towards the latter. Explanations for this piece of footage vary wildly. The bigfoot community has latched onto the video, calling it a juvenile sasquatch – noting the dark fur and long arms. 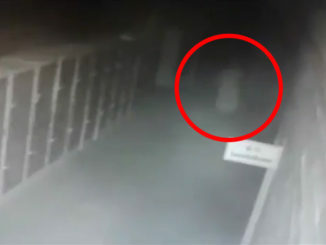 Other viewers have called it a zombie like creature that has risen from a nearby grave. The final, and most plausible, explanation is that they caught a grave robber in action. Because of the low resolution, it could be a cemetery raider wearing dark clothes and a mask of some kind – which would make it look like fur from a distance. Interestingly, the footage ends with a single photo of the plot of land that was dug up. It’s quite a sizable hole, considering it was dug by hand or claw. This bizarre piece of footage was sent to Youtube channel ApexTV in June 2018. Viewers are calling it a visit from a real member of the Men in Black. In an unknown law firm in Alaska, a secretary inexplicably went missing one afternoon after have a strange interaction with a suited man. In the CCTV footage you can see the secretary at the front desk typing things into a computer. That’s when a tall, bald man walks in wearing a black suit. He has a peculiar demeanour and precise mannerisms. Unfortunately, there’s no audio so we don’t know what’s being said but you can soon tell that the secretary becomes uneasy. At one point she shakes her head and points to the door as if asking the man to leave. The situation escalates further, as the woman grabs a gun out of the office drawer. She stands up. The suited man lifts his hand then tilts it to the side in a strange motion. It’s as if the secretary falls into a trance as she turns, takes the cartridge out of the gun and places them on the desk. The suited man then gestures once more and the woman complies by reaching into a bag, pulling out what looks to be a camera. She then calmly walks around the desk and out the door. The suited man follows. When the video was first posted, it quickly went viral, racking up over four million views with more than thirteen thousand comments all wondering what was going on in the footage. A lot of the comments were quick to call the man a real life member of the infamous Men in Black, an alleged top secret government agency that responds to paranormal events. Some even believe the agents themselves are alien hybrids that have mysterious abilities such as mind control. Others thought the whole video was staged and felt it was too good to be true but admitted that it is a curious piece of footage. So if the video is genuine, what is on the camera? Had this secretary been witness to some strange event and perhaps captured evidence that needed to be destroyed? Love to get your opinion on this one in the comments section below. Opening its doors in 2006, the Suvarnabhumi Airport in Thailand is home countless bone-chilling claims – from reports of airport staff being possessed, to shadow people lurking in the periphery and awful screams in the night. Since the reports began, there have been numerous shrines erected in the vicinity in an attempt to fend against the evil spirits. Unfortunately, however, staff quickly realized that the shrines were no help. One of the very first occurrences was with a security guard – who claimed he was possessed by an evil spirit, requesting a shrine to be made. Staff noticed his behaviour becoming increasingly erratic. He would shout at nothing and often linger around the airport into the night, well after his shift had ended. One night he was found in a trance, chanting in a bathroom. The following day he had no recollection about what he had been up to. The above video was taken in mid-2017 at Suvarnabhumi Airport by a security guard late at night. As you can see, there appears to be dozens of ghostly figures disembarking from a plane that isn’t there. The people have an eerie, translucent quality as they stream along the passenger boarding bridge, one after the other. Some experts who have reviewed the footage think that it might be a reflection of passengers walking along an adjacent terminal. Others have noted however, the strange pattern the figures make as they walk which suggests they’re actually behind the glass windows of the bridge. In recent years, many ceremonies and rituals have been held in attempts to push away any lingering spirits. Unfortunately, their efforts have been in vain thus far – reports have actually become more frequent over the past few years with eerie figures spotted down long dark hallways and disembodied whispers almost a daily occurance. There’s our look at some scary videos that simply shouldn’t exist. Have you seen any of these scary videos before? 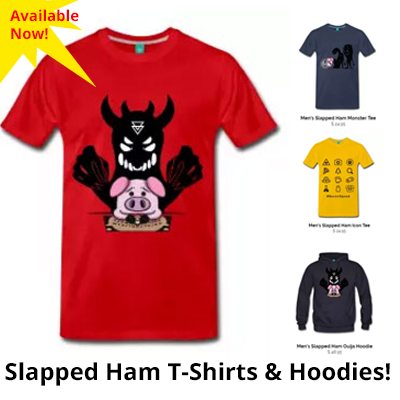 Love to get your opinion in the comments below or on any of our socials.